Today: The tricks to making the pizza of your dreams. Some nights, our pizzas have bubbling crusts, fancy mozzarella, and daintily strewn toppings. Other times, pizza comes in a glorious cardboard box to join us on the couch. Some mornings, we even take our pizza cold, and we feel not a single ounce of shame. As they say in Wedding Crashers, "It's like pizza, baby! It's good no matter what." No one knows Jim Lahey's pizza dough better than Jim Lahey: "Sounds like your dough is either too stiff (lacking water) and/or over-fermented, which decreases the overall elasticity of the dough." He adds that to ensure consistency, "always weigh your ingredients using grams." Once the dough is stretched, get it in tip-top shape for the oven. Sam1148 fills a spray bottle with half water, half olive oil, and says: "Shake and spray on the pizza dough. The water and oil will help to give you a great, crispy brown crust." "Remember to go lighter on the toppings than you think. Especially the sauce and the cheese," adds Dave on the grill -- this helps prevent sogginess. A quick bake pre-topping can work wonders. Says Christine: "Cook the dough for 4 minutes first, then take out of the oven, add toppings, and put back in until done." AntoniaJames does something similar, "docking beforehand, and about 2 minutes in, knocking down any pita-like puffing." 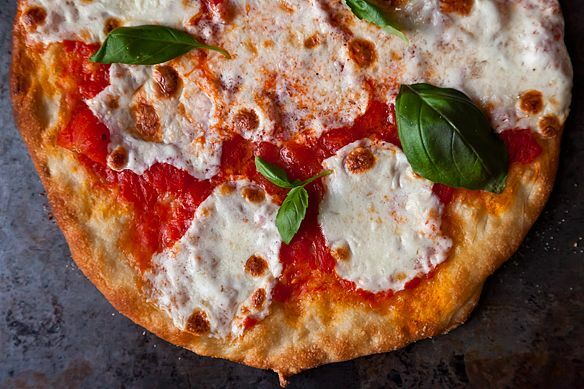 The hotter your oven the better -- so, until you get a giant brick oven of your very own, Dave on the grill recommends a pizza stone, which "helps out immensely because the stone can get much hotter than a regular pizza pan." It helps to give your pizza a little traction so that once the crust is perfectly, beautifully cooked, it comes off with no coaxing. Dave on the grill and nutcakes both use cornmeal, which doesn't compromise the flavor. Finally, finish strong by letting your pizza "rest on a wire rack to cool and crisp, to avoid soggy bottom crust," says Sam1148. 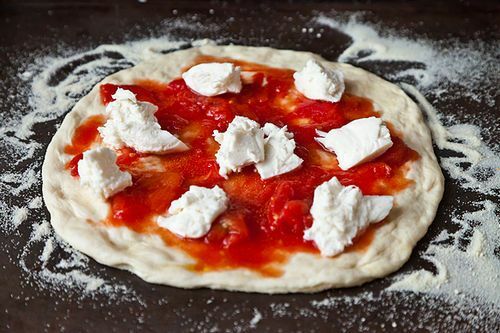 What are your strategies for a great homemade pizza? Tell us in the comments! I bought quite a few stones before buying the one I currently have that has lasted two or three years so far. I bought it from King Arthur flour company and it is very heavy,rectangular and holds heat great. I've used it in my gas oven and on my Weber gas grill outdoors with no problems. Check it out you'll be glad you did. Follow the pizza dough recipe from my Kitchenaid cookbook, let the dough rise in a warm oven for an hour, punch out the dough spread it out in a regular cookie sheet pan that has cormeal at the bottom...And voilà! Awesome pizza! Temperature is about your oven. My Wolf, 425 is perfect 450 too hot. My Dacor 475. If you have a GE or similar you risk burning out your electronics by going to high. That pizza can cost you $225. or more in new parts. Know your oven and be careful. I was lucky enough to learn how to make pizza from Wolfgang Puck along time ago, so I make pizza frequently. I go through a stone every three years or so. There messy to clean and require an hour to heat up. The stone can infuse some flavor over time if the pizza is baked directly on the stone. But I'm liking parchment paper to prepare and bake on. The quality of the crust and quick cooking that produces the best pizza. I use 1 cup semolina flour in my dough, 1/5 cup olive oil, 7 cups flour 2 T. sugar 3 T salt and 3 cups of warm water, 2 T. yeast for my dough. Slow rise overnight in the fridge , then I freeze some of the dough in one pizza amounts for later. I can defrost, make and bake before I can get delivery. I will have this steel 15 years from now, so compare to replacing the stone every few years. Do you really know whats in that stone too? Linda, before buying the pizza steel did you previously use a pizza stone? If so, how do the two compare? Thanks. Yes, I spent $100.00 on a pizza steel and I'm glad I did. New technique, Reynold's has a foil that has parchment on one side. Everyone can make there own pizza, write there name on the parchment and they go on the pizza steel at 425. 450 was too hot for my wolf oven. 6 minutes in and out. I use it for a lot of other things too. Concentrated heat. I leave it in the even all of the time. 13 pounds. Before I spend $100 bucks for one I'd love to hear from others who have used this technique. Wow! Based on someone's earlier comment I decided to try cooking my pizza on parchment directly on the oven rack. Was a little dicey getting it in (I slid it off of a flat round pizza pan as I have neither a peel or a stone) The result was nothing short of AMAZING! Crispy, bubbled crust, cooked in half the time and I could have sworn it came out of a wood or coal fired oven, not my regular old 500 degree oven. Hey guys - the link called "flawless" is actually spam - a window will come up about detecting a virus DO NOT click or open that window - the link needs to be disabled. Hi Miles, oh my gosh, I'm sorry to hear that! Thanks for letting us know, and I hope your computer isn't infected. Just changed the link so it should be all better now. Remy - no problem - I've had that pop up before so I knew what it was. Thanks for responding so quickly - and thanks for the tips on pizza - it one of the things I'm trying to learn - it never seems to want to stay stretched! Thanks again! I like putting hard cheeses on my pizzas, so I often will finely grate Gruyere or even softer cheeses like Fontina or Gouda, and sprinkle it lightly on the crust during the pre-cook phase. Then I put the other toppings on for the final cooking. Also, I often roast vegetables in the oven while heating my pizza stone (which I always do for an additional 10 - 15 minutes after the oven hit 500 degrees). I typically use those vegetables used for other purposes, but lately, I've been cutting small dice of butternut squash and roasting them for topping my winter pizzas. My latest favorite combination with the squash is sage (lots of it), salume, caramelized onions if I have them on hand and, immediately after removing the pizza from the oven, arugula. We add speck or jamon serrano at the same time, when not using salume. For that pizza I also smash some of the diced roasted squash with a fork and spread that on the pizza, over the melted cheese, before putting on the other second-stage ingredients. I own a small wood fired pizza catering company and can concur with a lot of the statements in the article, a few of the standouts are: weighing your ingredients while making dough. We use 00 milled flour for best results (think Caputo). Portion control- top your pizzas with a light hand, we like to follow the rule of 3 when it comes to toppings. Precook toppings that release water or grease- mushrooms, spinach, sausage etc. that way it doesn't get your crust soggy when cooking. And in a pinch if you don't have a pizza stone you can cook pizza on parchment paper and place it directly on your oven rack at the highest temp possible. No clean up or sticking! Growing up in Brooklyn and still so loyal to my 'Brooklyn' pizza, I have to admit, Jim Lahey is a contender. I've made several and they are just right. Who wouldn't love to have a wood fired pizza oven? To get the wood flavor, I grill my rolled out dough outside on my Weber grill over wood coals. I then top them and bake in my oven. Again, the key is not to overload with toppings. You can even grill them ahead of time and bake off later. Not the same as in a wood oven but comes pretty close. I have pizza dough down to a science at this point, but I really like the idea of spraying the dough with water and olive oil. I will be trying that out next time I make pizzas. King Arthur Flour sells an awesome stone....I just need a larger wood peel. I cook my pizzas at 550 after heating my stone for over an hour. I'm working on changing up a dough I found on 101 cookbooks. The nice thing about making your own pizza is you can control what goes on it. I allow my dough to rest for three days in the fridge. We get six personal sized pizzas out of a batch...it's really cheap when you think how much a pizza from a pizzaria is! Sliding the uncooked dough off the pizza peel makes me so nervous - all that work can go to tatters if you don't do it perfectly. What I do now is I press out my pizza dough on a piece of parchment paper cut to fit my stone, then slide the parchment with the loaded pizza onto the peel, then onto the hot stone. I put my pizza on parchment too, and then after a couple of minutes I pull the parchment out from under it. I find the bottom of the crust browns up nicer w/o the parchment. Really good pizza flour helps--I use Molino Antico pizza flour from Eataly. My results are always flavorful, chewy outside curst and no matter the fluidity or dampness of toppings, extraordinarilily paper thin crisp crust throughout. The most basic elements of a successful pizza are 1)wrap the dough in cling wrap and give it an overnight rest; it freezes well too. 2) Your oven needs to be screaming hot. Most home ovens won't exceed 505F, but if that's the best you can do...I just cringe when I see recipes recommending 450F. 3)I don't have a wood burning oven but I can jury rig one by using a stone piastra which fits nicely on my grill top. I use really oak lump charcoal. I can get this up to over 600F. Don't try this indoors. 4)Don't pile on the toppings. In Italy pizza is minimally dressed---it's not Papa John's "Double Cheeseburger." Whoever thought that one up should be committed. Serve at once while the crust is still crisp. Be sure you have a nice blistered outer crust. In Italy this is referred to as the "cornice". Flat pizza is boring.